Weighing in with just a $13.2 billion market cap, Textron (NYSE: TXT) has always been a sort of second-string defense contractor, overshadowed by giants like General Dynamics ($50 billion market capitalization) on the ground, and Lockheed Martin and Boeing (NYSE: BA), valued at $85 billion and $224 billion, respectively, in the air. In 2013, Textron made a bold move to break into the fighter jets market and challenge those last two companies -- building a "Scorpion" fighter jet on its own dime and using off-the-shelf parts -- but to date, Textron has failed to sell a single one. One place where Textron found success, though, was with its early entry into the drone wars, where its Shadow unmanned aerial vehicle found quick acceptance from the U.S. Army and has racked up "over one million flight hours" in service with the militaries of the United States, Australia, Sweden, and Italy. The U.S. Army is looking to buy a new drone -- and this one should be able to shoot. Image source: Getty Images. First introduced into service nearly two decades ago, Shadow is beginning to show its age. Earlier this week, multiple news outlets, including Aviation Week and Janes, reported that the U.S. Army is dissatisfied with the Textron RQ-7 Shadow's size (requiring C-130 transport planes to carry it), its need for a runway (to land), and -- perhaps most importantly, its noisiness. 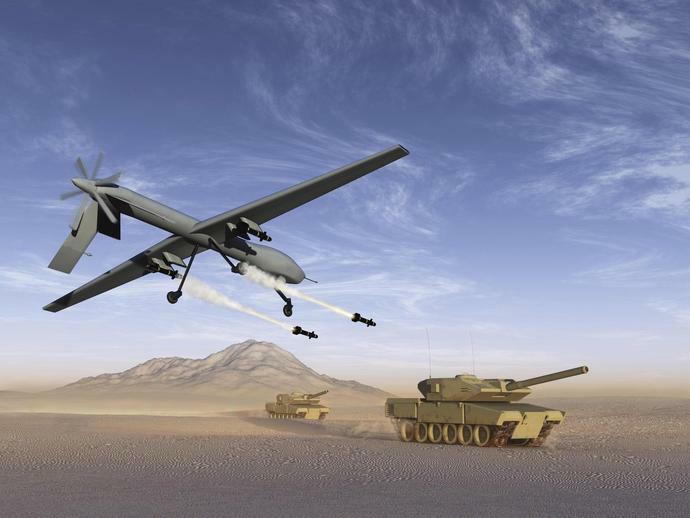 AW in particular noted Army complaints that Shadow is "a bit noisy over the target," which can alert targets to the drone's presence, neutralizing its effectiveness. To remedy these perceived faults, Janes reports that the U.S. Army is planning to "downselect" three potential replacements for the RQ-7 Shadow. The Army will be seeking a new solution that's small enough to transport on a Boeing CH-47 Chinook helicopter but large enough to carry weapons, a drone that can operate without runways, and one with "a lower acoustic signature" than the Shadow. To date, the Army has not disclosed which companies will be submitting UAVs for consideration to become the Army's new go-to drone. AW did note, though, that when faced with a similar decision last year, the U.S. Marine Corps traded in its Shadows for RQ-21A Blackjacks built by Boeing subsidiary Insitu. Will Boeing's drone replace Textron's...again? Despite sporting a wider wingspan than the Shadow, Boeing's Blackjack is about 27% shorter and weighs half as much, allowing the Boeing drone to be launched from a mechanical launcher, without the need for a runway. At present, it's not known if Blackjack can carry weapons, although Boeing is said to be working with the Marines to modify Blackjack to carry "various payloads" -- which may or may not include weapons. Ultimately, I suspect the Army will have to make a decision to choose a drone that's small enough to launch mechanically and small enough to be helicopter-transportable, or one large enough to carry weapons -- because you can't always get everything you want. As I said, it's not certain which UAV that will be. Once the Army has selected its three finalists, each will be asked to submit two sample UAVs for the Army to experiment with before making a decision -- a process dubbed "try-decide-buy." AW notes that the Army is currently only looking at existing drone systems to replace Textron's Shadow, which probably limits the number of potential bidders. Given its success with the USMC last year, Boeing will almost certainly bid on this contract. Textron, meanwhile, might bid its smaller Aerosonde UAV to replace the Shadow. Potentially, this contract might even give Northrop Grumman a chance to bid the new Tern UAV that it's developing for the Navy, for use by land forces. At 40 feet, triangular, Tern is considerably larger than Shadow, but the new drone boasts a vertical take-off and landing capability and is being designed to carry as much as 600 pounds of ordnance, ticking two of the boxes on the Army's wishlist. Whoever ultimately wins the contract can expect a big payday. ArmyTechnology.com reports that, through 2010, U.S. ground forces alone had purchased nearly 500 Shadow UAVs over the course of less than a decade. Depending on the price tag of the drone picked to replace it, someone could end up winning contracts worth $2 billion -- or more. Rich Smith has no position in any of the stocks mentioned. The Motley Fool recommends Textron. The Motley Fool has a disclosure policy.